Neighbours. We all have them and we all are one. For many reasons, it’s a good idea to be on friendly terms with your neighbours, even if it’s just a brief nod and hello as you pass in the street. So with that in mind, here are some suggestions on how to be friends with your neighbours. When you move into a new place, try and introduce yourself to the neighbours. By this we don’t mean marching round all the nearest doors the very day you move in, but make the effort when you see any neighbours in the first week or two to introduce yourself and have a quick chat. 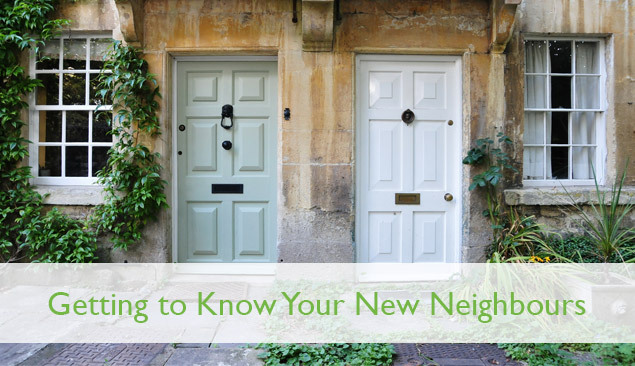 Likewise, if you notice a new neighbour moving in, introduce yourself to them when you get the opportunity. A really useful tip is to write down the names and house number of anyone you meet so that you don’t forget it! When you are new to the area, neighbours can be a great source of local information from the nearest doctor’s surgery to a good plumber to the best local pub. Everyone loves to give an opinion and people are usually happy to share their local recommendations! If you want to be friends, be a good neighbour. The main problems between neighbours tend to arise over noise, parking and DIY/building works. Keep the noise down, especially first thing and late at night. If you’re planning any building work, let your neighbours know and give them and idea of what to expect – it’s important to note here that you are not seeking their permission, but you are simply keeping them informed. Be a considerate neighbour and try to treat them as you would like them to treat you. Despite the suggestions in the last point, sometimes problems do arise. If a neighbour feels the need to come and speak to you about a concern, listen and acknowledge their views. They might have a complaint about something you consider too trivial or it might be serious – either way, listen to what they have to say and try to have a reasonable, grown-up discussion about it. Some people love to become best friends with their neighbours while others prefer to stay on simple nodding terms. Don’t force a friendship and respect your new neighbour’s self-imposed boundaries. That way, you will hopefully maintain a good neighbourly relationship that suits everyone.